$55 New No Deposit Welcome Bonus Program to all GKFX Prime new direct Clients. 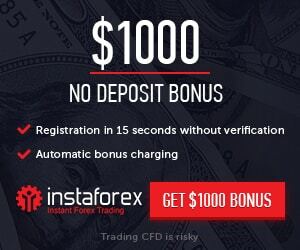 This $55 New No Deposit Welcome Bonus Offer clients the chance to get start the trading markets in a real environment without having investing their unique funds. The $55 No Deposit Welcome Bonus promotion will be applied on request. The bonus promotion will be applied only once. Bonus will be cancelled upon first withdrawal. The client can submit a bonus request no later than 5 business days after she/he opens the account. Requests submitted outside of this time limit will not be processed. Bonus ammount can not be withdrawn but clients may withdraw their profits if she/he meets the requirements stated in the T&C. f) Clients may apply to this bonus offer by requesting via phone or sending an e-mail to their local representatives or to support@gkfxprime.com . Maximum profit made with bonus account is $ 550 Profits can be withdrawn after 5.5 FX lots has been closed. Indices, commodities, cryptocurrencies, CFDs will not be taken into consideration. Trades closed before 2 minutes time will not be taken into consideration.